I’m so excited to announce!!!!! Choices of the Heart, a part of my Daughters of the King Bible Study Series, is now expanded and revised and available through Elk Lake Publishing. Check it out: http://amzn.to/1oiqoFn. Originally published by David C. Cook, the Daughters of the King Bible Study Series sold 100,000 books. Choices of the Heart is a ten-lesson women’s Bible study featuring two women of the Bible in each lesson, including both commentary and individual/group discussion questions. The study is designed for individuals and groups. The two biblical women contrast the right and wrong ways to respond on different topics. My commentary delves into the background of each biblical woman and also gives insights into the meaning of Scripture passages. Plus, I incorporate questions that help the student apply the biblical principles to her own life. Martha and Mary: practicing God’s presence while doing God’s work. Each lesson features my signature “Letter from God” that touches the heart of the woman student. I’m excited about using your influence on others. Your society may try to convince you you’re insignificant and powerless, but I can empower you to make a difference. You were created with a purpose, and I know exactly what I want to accomplish through you. At times, you may think what I’m calling you to isn’t significant. Many of my callings are not valued by the world. Diapering a baby may not seem influential. Helping at a shelter may not seem significant. But anything I call you to is significant in my eyes. So agree with what I find important and respond to my call regardless of the world’s values. I understand your broken heart when it seems you’ve failed. You may believe you’ve touched others in a hurtful way. But I am powerful enough to correct and heal even sin. Will you confess those areas of failure or disobedience? I’ll forgive you—and help you to forgive others and for them to forgive you. Do all you can in my power and continue growing in love toward others. You are making progress. I’m pleased. 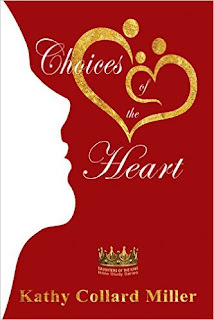 Choices of the Heart is available at your Christian bookstore and online Amazon. http://amzn.to/1oiqoFn. I am always looking to recommend resources for women that further the depth of our walk with Christ. The Daughter of the King series does exactly that. You’ll discover the wealth you have in knowing the King of Kings and begin walking in the royalty you possess. Kathy has done stellar research and written a masterpiece crafted to enrich the reader’s knowledge of the Bible and their spiritual life. Nicci, thanks so much for your support and encouragement! We have used Kathy's book "Choices of the Heart" for our women's fellowship this year and have gained so much insight as to how much we relate to these powerful women of the Bible. It was so successful that we have decided to use Whispers of my Heart for our next years study. Kathy is an amazing tool of our Lord and we so appreciate her obedience to share her gift! Thank you so much Kat, for letting my readers know about this. You know how much I've enjoyed working with you and seeing the responsiveness of the women. You're the best!